How do I find out which companies and banks are involved? Coal investments are a dying breed in the EU, but some investors are still ready to try their luck in Southeast Europe and Turkey. CMEC is a subsidiary of the state-owned giant China National Machinery Industry Corporation (SINOMACH), the 326th largest company in the world in 2013. CMEC mainly undertakes contracting in engineering projects in the power, transport and telecommunications sectors. CMEC has already been involved in the ZETES 2 1200 MW coal power plant project at Çatalağzı in Turkey, and is now undertaking a rehabilitation and installation of desulphurisation equipment at the Kostolac power plant in Serbia, which is expected to be followed by the construction of a new 350 MW unit, B3. In 2013, the Chinese Ministry of Commerce and the Ministry of Environmental Protection issued the Guidelines for Environmental Protection in Foreign Investment and Cooperation. These Guidelines are not legally binding but can be quoted as a policy that CMEC should act in line with. In addition, while doing business in the EU or potential EU countries, it can be argued that companies should act in line with EU legislation. CMEC does not have a public grievance mechanism and does not publish much information about its staff on its website. Therefore getting in touch is not easy: you need to send faxes and hard copies of letters. For more information on the appropriate style to use when contacting Chinese banks and institutions, see here. It is usually difficult to find out the relevant person to contact, so first look for some clues in the media coverage of the project or the particular office of the bank in question. For the Chinese headquarters, if you cannot find a specific person connected to the project or the region where the project is situated, write to the most senior people listed on the website. You should not expect to receive an answer quickly, if at all. This can be discouraging, however do not underestimate the impact of receiving letters from local groups or affected people. As CMEC is a state-owned enterprise, it is directly responsible towards the State-Owned Assets Supervision and Administration Commission (SASAC). Projects with a total investment of over USD 30 million or with over USD 10 million in foreign exchange must also be approved by the National Development and Reform Commission (NDRC). Therefore if your communication with the company does not yield any results, it is possible to also contact the SASAC and the NDRC. While you are in the process of contacting companies that are involved in investment projects of your interest, you may wish to communicate to the Chamber of Commerce or bilateral/regional trade associations in your respective country to learn about the companies’ activities and locate the relevant point of contact. 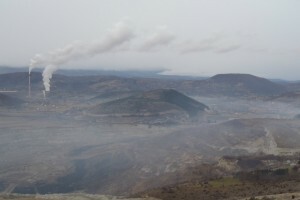 Çatalağzı in the province of Zonguldag may be a traditional coal mining area, but since the 2x615 MW Zetes II went into operation in 2010, serious additional impacts have been felt by local people. This site was created by CEE Bankwatch Network. The Network works across the central and eastern European region to monitor the activities of international financial institutions and propose constructive environmental and social alternatives to the policies and projects they support. This website has been produced with the financial assistance of the European Union. The content of this website is the sole responsibility of CEE Bankwatch Network and can under no circumstances be regarded as reflecting the position of the funders.